Ngorongoro is one of the most important Wildlife reserves and Archeological sites in Africa. Its fame and popularity is well deserved as it is not only one of the most spectacular Calderas (collapsed volcano) in the world, but also a successful example of multiple land use Conservation. The pastoralist Maasai with their herds of cattle and goats live peacefully and reatively inconspicuously alongside the wild animals of the Ngorongoro. There are about 20,000 Large Animals and thousands of Birds including Flamingos living within the Crater walls. These incude predators such as Lions, Leopards; and Herbivourous Zebras, Gazelle and Antelope. Large Herds of Buffallo and Wildebeest graze on the grasslands of the Crater floor, and pleny of Elephants and Hippos wallow in the mud swamps and soda Lake. Up the trees of the Lerai Forest you will find small Monkeys and Baboons, while Elephants graze in the shade beneath. 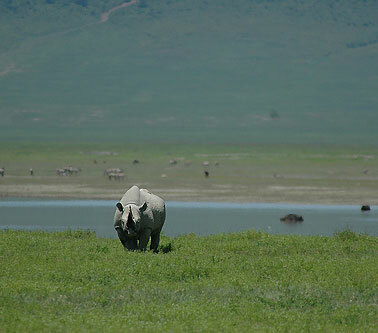 Ngorongoro is also home to some of few remaining herds of Black Rhino in East Africa. Venture to Laetoli to see the preserved footprints of Hominoids who lived there at least 3.6 million years ago. Another archeological site is at the volcanic river Canyon called the Olduvai Gorge; there are 2 million year old remains of Hominids and animals.The Maasai who appear to be almost a part of the landsacpe actually came to this area only 200 years ago! Perched on the rim of the collapsed volcano, it has the most magnificent views over the crater floor. Its position on the Eastern rim allows the most spectacular and uninterrupted views of the sunset. 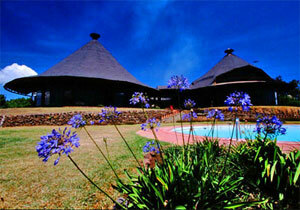 Overlooking the rim of the crater, stunning views, from lilac-streaked sunrises, to indigo star-studded nights. 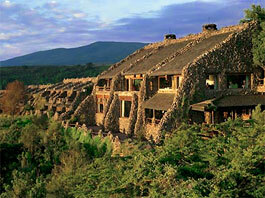 Ngorongoro Crater Lodge stands on the edge of the world-famous Ngorongoro Crater. 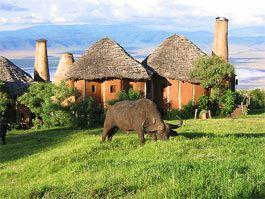 It is one of the most architecturally spectacular safari lodges in Africa.